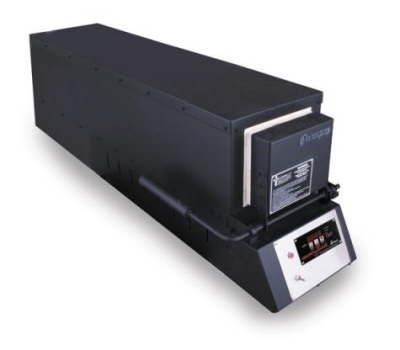 The Paragon Express-KM-36T furnace is single phase , UK plug fitted . The furnace inner chamber measures, Volume 13.88 Ltr. Width 140mm x Height 108mm and a depth of 914mm. Exterior measurements are 432mm width x 1245mm depth x 432mm high. This is a "special " order furnace and delivery will be 4-6 weeks after you have placed your order. Due to the kiln size and weight there is a £40.00 delivery charge for UPS delivery. When you own a Paragon Xpress-KM-24T furnace, our most popular size, you can live the knife making adventure to the fullest. You will actually witness the birth of your knives in the bright red heat of the furnace. And all Paragon furnaces are now rated to 2350F, so you can fire as hot as you need to. In addition, the Xpress-KM-24T features the economical 3-key Sentry Xpress temperature controller instead of the full 12-key Sentry. Save on the price of the furnace and still get the same digital accuracy knife makers have come to expect from Paragon. Many knife makers enjoy owning a furnace, because they can revel in testing their favourite steels. They put blades through tests more severe than any knife owner would dare. They test for Rockwell hardness. Then they count the number of times the knife can cut hemp rope and 2x4s. They bend the blade to 45° or even 90°. Then they straighten the blade and test it in the real world. The knife maker with a Xpress-KM-series furnace can try exotic heat treating methods at his leisure. The economically priced yet still robust Sentry Xpress 3-key controller can heat treat in eight segments and store four programs in memory. Does quenching in dry ice improve blade performance? What happens when 52100 steel is triple-quenched with a one-day wait between each quench? After this treatment, will a 52100 blade bend to 90° without chipping? With a Paragon furnace in your shop, all questions about heat treating formulas are finally settled. You find out for yourself what works. Testing and heat treating are at the heart of the knife making adventure. Here is where your confidence as a knife maker takes root. Experiment with differential hardening, an ancient bladesmith technique. Try out the newest tool steels. Are they really as good as the tried and true D2 and A2? Paragon’s knife making furnaces are now rated to 2350 degrees F (1287 Celsius), so you can heat treat as hot as you need to.